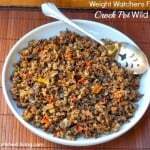 Here’s a delicious crock pot wild rice recipe that we all liked a lot. I don’t think I ever ate wild rice until I started visiting Wisconsin, where it is very popular. And even now, every time I taste it, I wonder why I don’t eat it more. In addition to being delicious, wild rice is good for you. A Weight Watchers Power Food, it has more protein than quinoa. I adapted it only slightly, using a combination of different colored mini bell peppers instead of just one color. 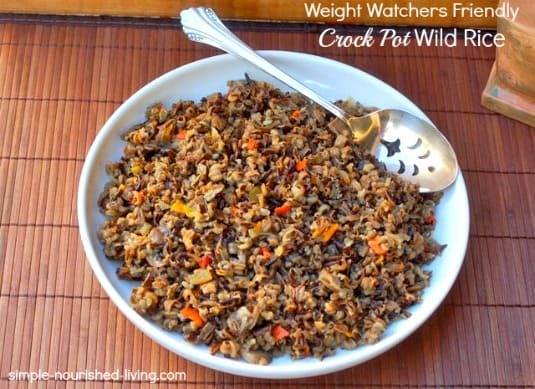 Each 1-cup serving of this yummy crock pot wild rice has 180 calories and *5 Weight Watchers Points Plus. I think this would work with the Simply Filling Technique too. Easy, healthy and delicious, this crock pot wild rice is a keeper in my book. Drizzle the olive oil over. Sprinkle with salt and pepper. Pour the broth over the rice and vegetables. Cover and cook on LOW 4 to 6 hours OR on HIGH for 2-1/2 to 3 hours OR until rice and vegetables are tender and liquid is absorbed. My crockpot wild rice was done in about 4 hours, but my slow cooker definitely cooks hot, so yours may take longer. Rice will get mushy if you hold it on WARM for too long in the slow cooker. So, as soon as my rice was tender and the liquid absorbed, I transferred it out of the crock pot and into a serving dish until dinnertime. I then just re-warmed individual servings in the microwave. *PointsPlus® calculated by Simple Nourished Living; Not endorsed by Weight Watchers International, Inc. SO good! Have made quite a few times. Even made as a meal for a family with a new baby. It’s that good. Made one with vegetable broth but much prefer chicken broth. Thaks! Thanks, MG. So glad to hear you like it.